The logistics arm of Chinese e-commerce giant JD.com recorded losses of more than 2.3 billion yuan ($342 million) in 2018, posting its 12th straight year of losses, the company’s founder and CEO Richard Liu told staff in an email on April 15. In an internal letter obtained by Chinese state-run media 21st Century Business Herald, Liu said that JD Logistics would be closed within two years if the business didn’t change its practices. “The core reasons [for these losses] are the lack of orders from external clients, and the high operating costs,” Liu wrote. The internal announcement comes just days after JD.com confirmed it would scrap couriers’ fixed base salaries, so their monthly income would only come from commissions made on their deliveries, as well as reduce contributions to employee’s housing funds to 7 percent from 12 percent. In the letter, Liu said that JD Logistics’ loss figure would rise to 2.8 billion yuan ($417 million) if orders from JD.com’s retail arm were excluded from the calculation. “We only have two solutions in front of us: One is to increase external orders that can bring in more revenue; the other is to cut internal costs including by reducing everyone’s benefits,” Liu wrote. While JD Logistics started taking orders from external customers in late 2016, orders from the company’s retail platform, JD Mall, still make up most of its business, Chinese business magazine Caixin reported. A few days before the internal communication, a JD.com employee leaked another email from the CEO, in which Liu vowed to sack three types of employees: those who “can’t work as hard as a fighter,” those are aren’t capable or who have poor performance, and those with a low price-performance ratio. In response to the leak, JD.com said the comments were taken out of context and distorted the meaning of the whole email. On April 11, JD.com confirmed an employee of JD Logistics committed suicide at the company’s Beijing dormitory on the evening of April 10. The company said the employee suffered from severe depression. But several Chinese media, citing anonymous JD.com employees, reported that the employee, a young man, committed suicide on the same day that JD Logistics terminated his employment. Hong Kong-based Phoenix Television reported on April 11 that the employee had signed up for an internal program in which the company loaned employees money to buy an apartment. The outlet reported that when the man was laid off, JD.com asked him to repay the entire loan amount, which totaled several million yuan (1 million yuan is about $149,000). According to Phoenix, the employee couldn’t find a way to repay the money, and took his own life. In response to that report, JD.com said it needed more time to verify the claims. On April 9, The Information, citing anonymous investors briefed on the matter, reported that JD.com is looking to slash 8 percent of its workforce by the end of April. The report was later denied by JD.com. According to its 2018 annual report, JD.com had more than 178,000 full-time employees as of Dec. 31, 2018. 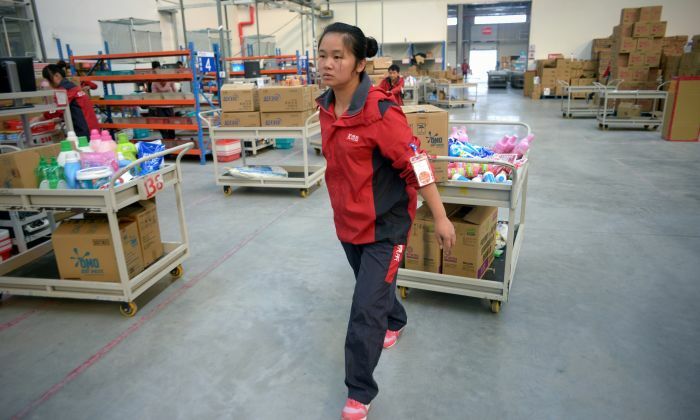 More than half of them work at JD Logistics, meaning most of JD.com’s employees are couriers. Earlier in February, state-run magazine China Entrepreneur reported that JD.com confirmed it would lay off 10 percent of its vice president or higher level managers, a pool of 80 to 100 staffers. Since then, Zhang Chen, JD.com’s chief technology officer; Rain Long, chief legal officer; and Lan Ye, chief public affairs officer, have resigned. They all cited personal or family reasons for leaving the company. In the post, Liu said he slept no more than two hours each day when he first founded JD.com, and still works an “8116+8” schedule—which means 8 a.m. to 11 p.m. from Monday to Saturday, 8 hours on Sunday—with two days’ break a month, and one long vacation each year. Liu said he doesn’t force all employees to work a “995” or “996” schedule, which means working from 9 a.m. to 9 p.m. for five or six days per week. But he noted that “slackers” should be fired. His comments come amid an online campaign launched by Chinese tech workers to protest long working hours and overly competitive company cultures, which experts say have negative health effects.